I’ve tried a number of podcast apps in the past and my favorite, by a small margin, is Pocket Casts. 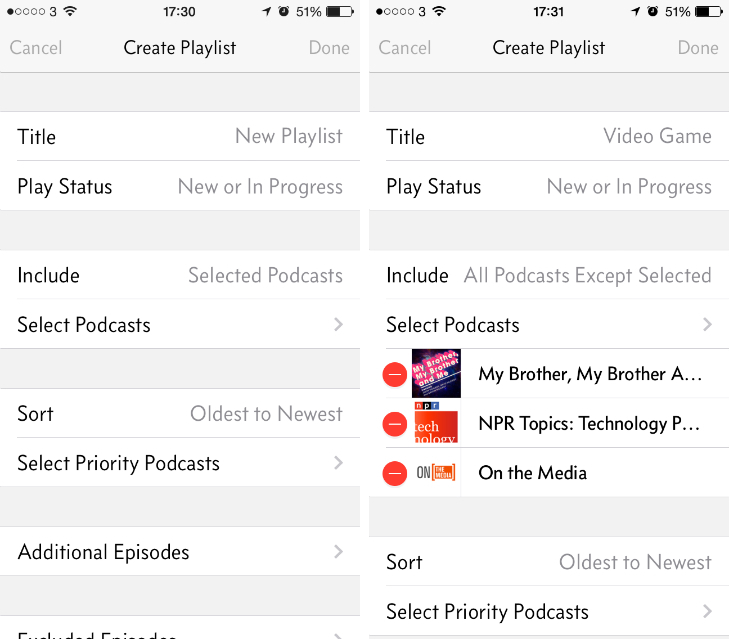 It’s not perfect though and Marco Arment, the founder of Instapaper and co-founder of Tumblr, is the latest to step into the fray with a minimalist iPhone app called Overcast. 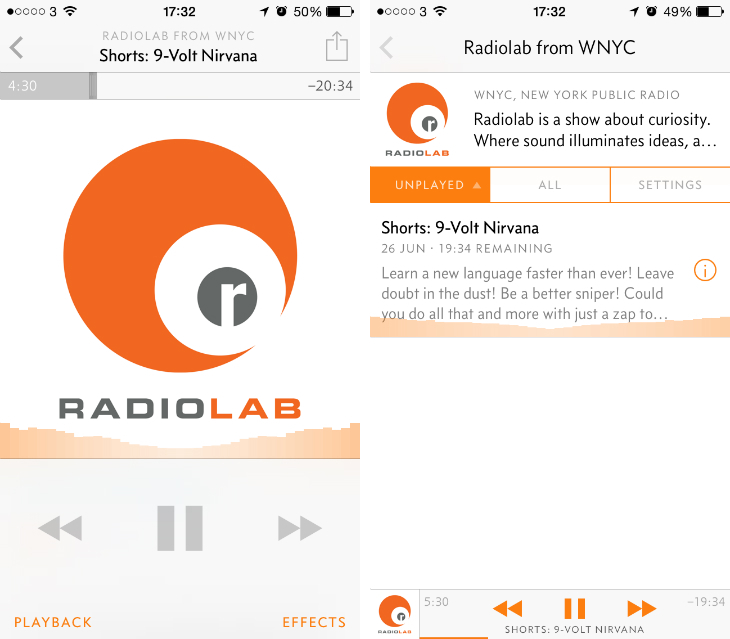 The podcast player sports a clean design that, with a sidelong glance, could be mistaken for Instacast with its orange accents and sparse menus. 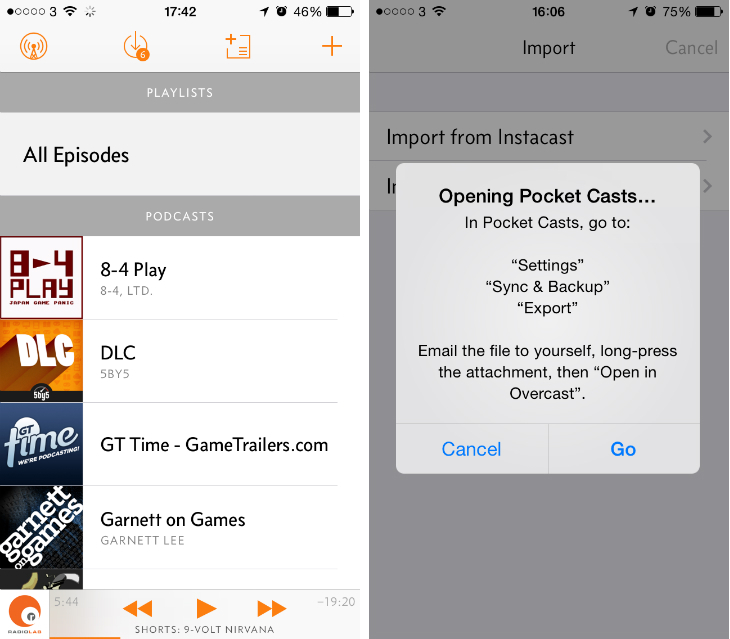 Veteran podcast listeners will appreciate its on-screen instructions for how to import shows from either Pocket Casts or Instacast – it’s a basic guide for importing OPML files, but the process is surprisingly painless. Otherwise, you can tap the plus icon in the top right-hand corner to view Overcast’s curated podcast directory. They’re split into genres such as business, games, health and technology – each contains roughly six to nine shows which feel like they’ve been hand-picked by Arment. They’re all great choices, but while I was skimming through the sections I was struck by the lack of depth and variety. If you’re a diehard politics fan, for instance, I suspect you’ll want more than half a dozen podcasts to choose from. 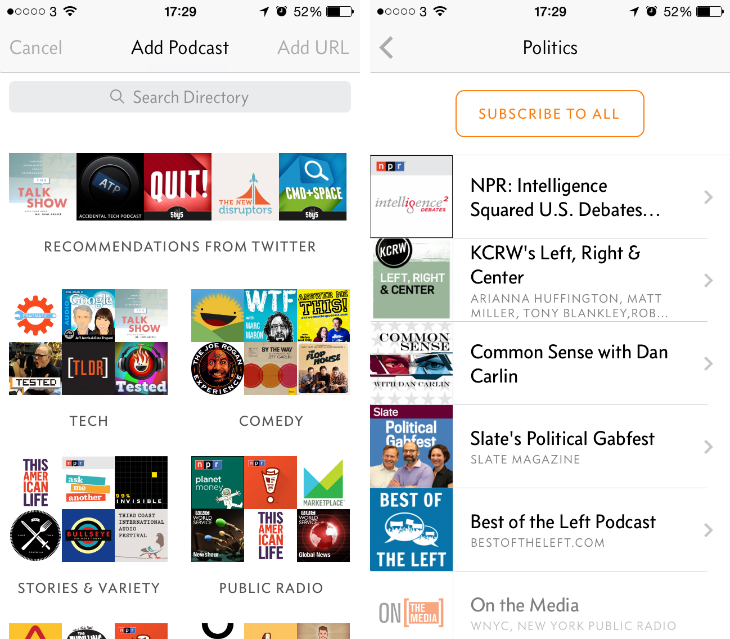 Thankfully, Overcast gives you the option to search for podcasts manually and also import them with a custom URL. Furthermore, there’s a nifty option that lets you connect your Twitter account and see what shows the people you follow are listening to. It’s not clear exactly how these are surfaced, but the feature adds a social layer to what is normally a solitary listening experience. Once you’ve finished subscribing to all of your favorite shows, they’ll populate the home screen in alphabetical order, complete with a small piece of cover art on the left-hand side of the screen. It’s a polished look, but hardly revolutionary. Now for a difficult pill to swallow: Overcast doesn’t support streaming. Most of the time this isn’t a problem for me, but on the off-chance I’m somewhere without an internet connection (say, on the tube) I won’t be able to spontaneously download an old episode from my library and start listening. It’s not a huge omission, but something you should consider. The player itself is well-designed with large icons for play/pause and skipping forward/backward through the episode. A quick swipe up on the artwork reveals the show description, notes and links, as well as the option to favorite the current instalment. A lovely touch is the EQ bar that plays along in the background; it’s a rare feature in podcast players and can be seen in other parts of the Overcast app too, such as the mini-player at the bottom of the screen. 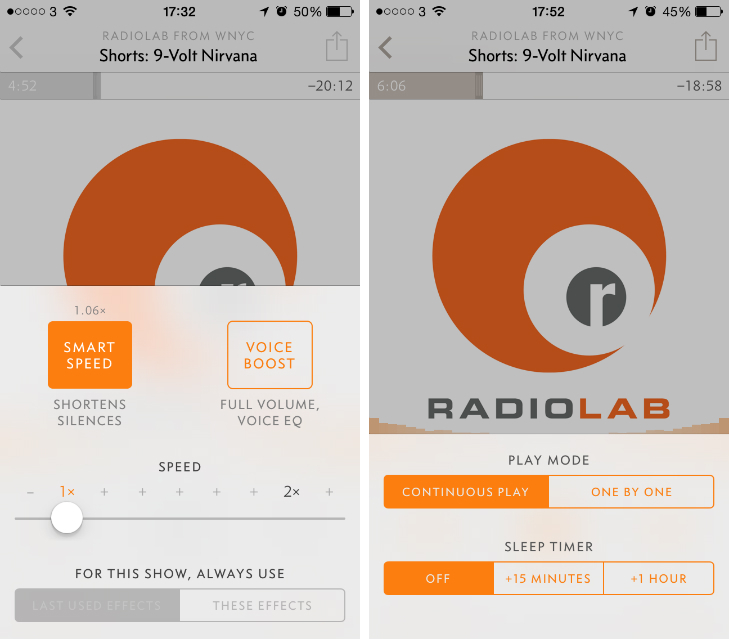 The app is free to download and, even if you don’t spend a dime, it’s a fairly robust podcast player that anyone can wrap their head around. Overcast differentiates with a paid upgrade, however, that unlocks a bevy of additional features including Smart Speed. This novel trick will dynamically accelerate individual episodes whenever there’s a patch of silence. In theory, this should keep the conversation natural while shaving minutes off the total run-time. The premium version also comes with Voice Boost, which naturally increases and normalizes the volume of each show. 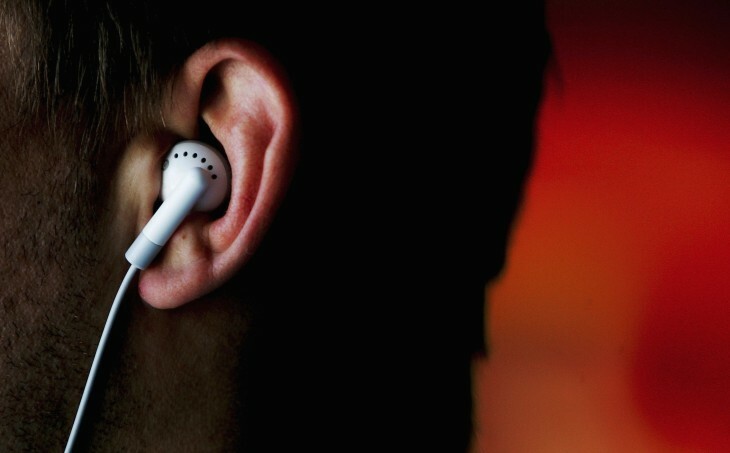 If you’re struggling to hear the host but don’t want to crank the volume on your iPhone any higher, this should improve the clarity while ensuring other shows don’t damage your ear drums. I suspect these two advanced tools are the reason why Overcast doesn’t support episode streaming at the moment. Whether you think they’re worth the trade-off is down to personal preference. For now, I’m undecided. The $4.99 fee will also give you access to cellular downloads and variable playback speeds, as well as a sleep timer for those moments when you accidentally nod off. If you’re passionate about ordering and custom lists, the paid version will also grant you unlimited playlists and episode additions. Overcast is certainly one of the better podcast players I’ve seen in this regard, with plenty of options for advanced users. Episodes can be sorted chronologically and reverse-chronologically, and it’s easy to quickly exclude episodes or make certain shows a priority. While you’re managing individual playlists, Overcast also uses the now widespread swipe-to-delete gestures pioneered by Mailbox. It’s a modern take that puts iCatcher to shame. Overcast is a difficult app to recommend. Some of its features are genuinely unique and I wouldn’t be surprised if other developers quickly copied them. The drive for simplicity has its drawbacks though and I still feel, overall, that the navigation and discovery aspects of Instacast and Pocket Casts are superior. Nevertheless, this is a valiant first effort and I’m interested to see how Arment develops the app further. One aspect certainly worth considering is the rather bare-bones web player; if you’re regularly moving between your iPhone and laptop – perhaps for work or academic purposes – it’s now easy to pick up an episode without launching iTunes. At the moment it’s simplistic, but if you’re after nothing more than a play button and volume controls, it works well. In short, if Arment can clean up some of Overcast’s design missteps, nail podcast streaming and launch equally polished apps for the iPad and Android (no small feat, mind you) this could be the perfect podcast player. For now, it’s just another app struggling to poke its head above the parapet.